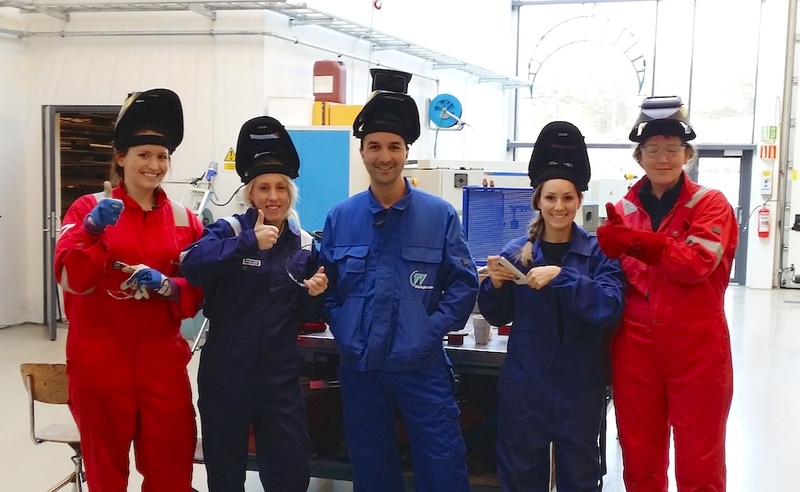 Participants at the first class of welding certification course at University of Agder. Left-right: Aina Øverås Skott (Stavanger), Vanessa Lopez (Bergen), Estaban Rodrigez (Oslo), Ana Carina Lobato (Oslo) and Gunn Helen Andersen (Oslo). The University of Agder is offering a two-semester welding certification course. The University has secured the rights to train international welding engineers (IWE) – the only training program of its kind in Norway. The first class, comprised of 37 students, of which 10 are from NODE companies, graduated in December 2015. The course is unique in that it has two entry levels, each leading to welding certification. Candidates that have completed a Bachelor degree in engineering will be eligible for an International Welding Engineer diploma/certification (IWE), while candidates with vocational school background are eligible for a Certified Welding Engineer certificate (CWEng) from the American Welding Society. ”It is important that candidates from companies’ design department take this course as well as employees from production departments. A thorough knowledge of welding allows the incorporation of sound engineering solutions during design phase thereby avoiding quality costs late in the project”, says Ann Marchioro, Chairman of GCE NODE’s Welding Committee. The IWE/WEng-program is based on the distance-learning concept with on-line theoretical lectures. Practical welding techniques, demonstrations and related topics are treated at weekend workshops. Organizing the course in this manner allows students to combine studies with a full time job. The University of Agder’s International Welding Engineer (IWE) program and Welding Engineer program (WEng) for engineers, technical and service personnel, who want to be certified as welding coordination personnel is a significant step in meeting the industry’s need for documented competence in welding and material issues. The requirements for welding coordinators with IWE qualifications can be found in several standards: NORSOK standard M-601: Welding and inspection of piping, NORSOK standard M-101: Structural steel fabrication. NS-EN 1090-2: Technical requirements for steel structures (in force since July 1, 2014 in Norway) and NS-EN ISO 17660-1: Welding of reinforcing steel. The program is developed according to guidelines by the International Institute of Welding (IIW). Requirements and curriculum for the IWE program is harmonized throughout the world. Candidates approved for admission by Norwegian Welding Association/Norsk Sveiseteknisk Forbund (NSF) will after the IWE program is completed, be qualified for the International Welding Engineer Diploma issued by NSF/IIW.